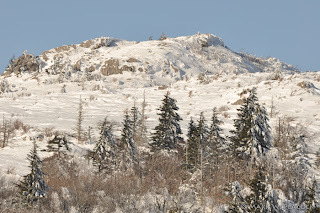 With its rocky peaks, soaring spruce fir trees, sweeping balds and panoramic views, Grayson Highlands State Park in southwest Virginia is among the most stunning and beautiful destinations in our region. The landscape is described as something resembling Montana more than Appalachia. It truly is a unique place. But most distinctive are the wild ponies that inhabit the mountains. 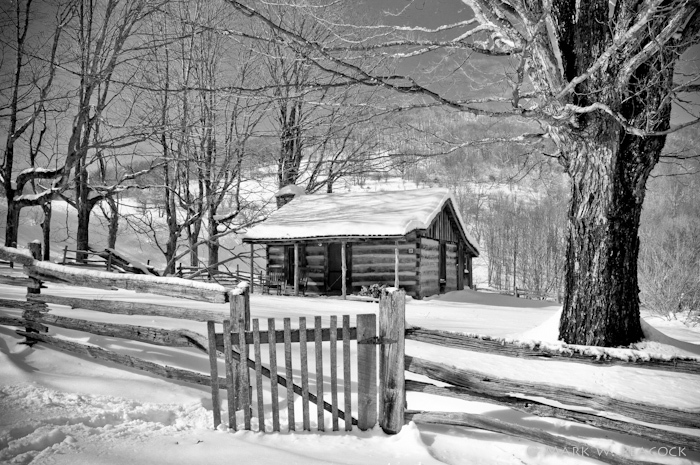 Located in the shadow of Mount Rogers National Recreation Area, Grayson often gets second billing. But the park is truly one of the gems of southwest Virginia -- I highly recommend a visit! There are numerous overlooks and vistas throughout the park, including Sugarland Overlook (which you pass as you enter the park), Buzzard Rock Overlook (near the gift shop parking area), Big and Little Pinnacle Overlook (trail begins immediate behind the gift shop), along with Wilburn Ridge and other rock outcroppings throughout the park. 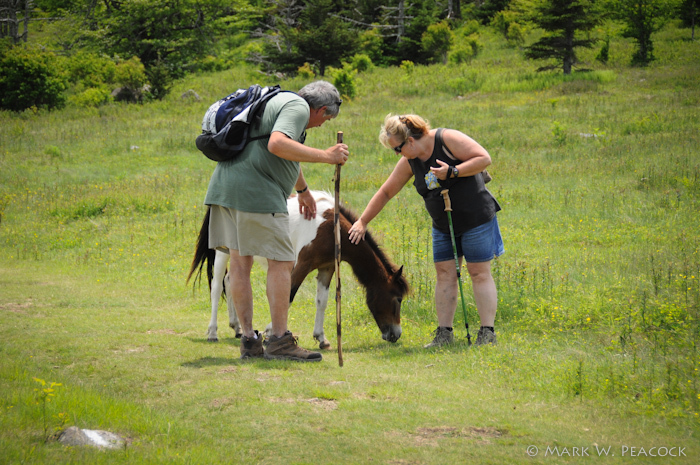 To be honest, the wild ponies at the Grayson Highlands State Park in Virginia aren't all that wild. Though park officials have policies against visitors petting and feeding the ponies, rustle a plastic wrapper and they'll come right to you. So something tells me that rule isn't strictly followed. One family I saw brought an apple for a treat -- at least it was a healthy snack. There are usually a few small herds of ponies at different parts of the park, so wander around the trails and you'll eventually find them. 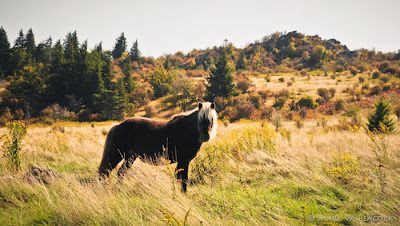 Once a year the ponies are rounded up and checked out for health problems - but other than that they're pretty much left alone to graze in the beautiful Grayson Highlands. If visiting the for first time, I recommend driving up to the top of the mountain first to visit the gift shop. From here you can take in the views from Buzzard Rock and Little Pinnacle (both are short walks). Then head back down and park at Massie Gap and take the Rhododendron Trail to where it intersects with the Appalachian Trail (0.8 mi). From here you can turn right and head toward a neat outcropping of rocks -- fun to climb, and great views! Or head left to where I usually encounter the ponies - and then continue heading up to Wilburn Ridge (elevation 5526) (two miles total distance). 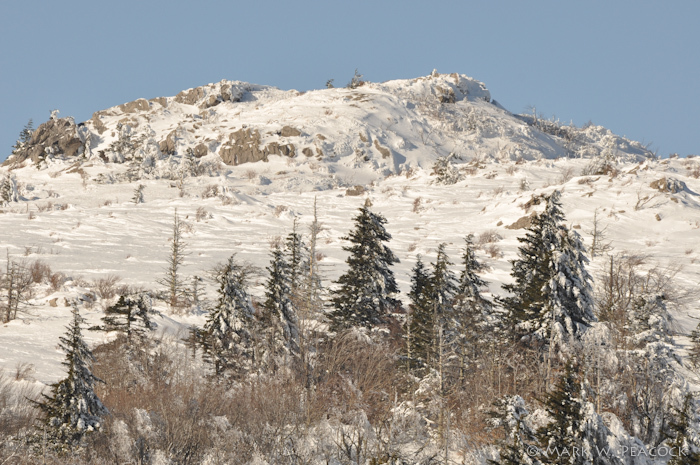 Another popular hike is to the summit of Mount Rogers (approx. 5 miles). In the summer months, I highly recommend sunscreen and water! Ninety percent of the trails are out in the open, so the sun can take its toll very quickly! During the winter months some parts of the park are closed. However, the road to the main trail head, Massie Gap, is open all year. More of my photos of Grayson here. The Sherpa Guide offers a complete description of the park and various hiking trails. Visit the official park website for maps and directions. From Tri-Cities, TN: take I-81 to Exit 19 (Abingdon, VA), go east on Route 58 about 37 miles to the park entrance. It's a very windy, but scenic road, so allow plenty of time. From Elizabethton, TN: take Highway 91 (Stony Creek Road) approximately 34 miles through Shady Valley and Backbone Rock to Damascus, VA. Once in Damascus, turn right onto US Rt. 58. Follow Rt. 58 signs and proceed 26.3 miles to the park entrance on your left. Continue on this main park road 3.5 miles to Massey Gap. (There's a $3 fee per car). Mark, thanks for all your beautiful photos, and comments. We absolutely love the Appalachian Region, and what is has to offer; people, arts, history, scenery. More people need to see this hidden gem! Yes I love that slideshow..never been there in the show but must try to make that happen sometime. And really great pics..you have an eye for photography that really communicates the sublime beauty of that area. I agree, the pictures really show the beauty of the area. It's crazy how we are so unaware of what these places have to offer! Would you suggest making a day of this park? Is there enough to keep ya busy?